Iceland’s Café Loki is a small gem of a restaurant, which––very fortunately–– is easy to find, as it’s directly across the street from Reykjavik’s most famous landmark, the towering columnar Hallgrímskirkja church, in what’s known as “the neighborhood of the gods” (each surrounding street named for an ancient Norse deity). This is appropriate as Loki, son of Odin and brother of Thor, is divine royalty. He’s also infamous as a trickster but Loki (the restaurant) is all treats and no tricks. It’s a cozy place with the main upstairs dining area dominated by a mural depicting the various inhabitants of mythical Asgard in characteristic poses up to their culmination in Ragnarok, “the twilight of the gods.” In contrast to this rather hellish coda, the food is pure heaven. Most ingredients are locally sourced (where else would you get “rotten shark” ––but more about that later) and prepared in small home-made amounts. Hrönn Vilhemsdóttir, the chef and owner, prides herself on cooking and serving authentic Icelandic cuisine but, if you’re unfamiliar with the offerings or just can’t make up your mind, I suggest one of the four “Icelandic Plates,” a sandwich smorgasbord of delectable toppings presented open-faced on the restaurant’s stellar rye bread. Far from being a mere delivery platform, the Loki rye bread is a 10 to 12 hour process whose yield must be tasted to be believed. There’s the crunch of good oven-baked bread (in the olden days, baked in hot springs! ), followed by the dark, earthy sourness of the grain which is offset with just enough sugar for a sweet finish. Café Loki also has flatbread sandwiches and even a spelt bagel. I started with the must have Icelandic lamb soup (Kjotsupa). The sensational lamb is from a breed harkening back to the time of the Vikings and is complimented with slow-cooked vegetables (and sometimes, grains) for a warm and satisfying repast. You may be tempted to, but don’t stop there, for you’ll miss the sandwiches. Toppings include everything from simple, but oh so fresh and tasty country butter through 3 types of herring, cheese, pates of lamb or smoked fish, ham, and marmalade. Being an island nation, Iceland is swimming in fish. Besides the expected and always delish herrings, the smoked salmon and/or trout are deceptively simple marvels. Rich, dark flavors of smoldering fire are background for a cast of tastes which gracefully take their bows in turns. You can’t help but savor the yumminess. When food is this good, you’re inclined to trust the kitchen and try things that you ordinarily might not, such as another trad fav: dried fish with butter (!) The stiff fish plank is relatively colorless and odor free and the first bites are cardboard/jerk-like until the flavor kicks in; salty, meaty and both oiled and mellowed by the butter. I works!––and this visitor understood its local appeal. It’s a bit of a chewy challenge but worth the effort. 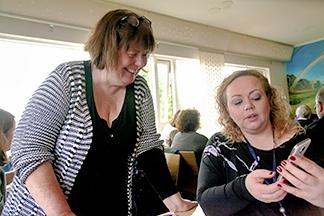 While I was busy masticating, Chef Hrönn came by to check in with her customers and Heidi, my city guide, whipped out her phone to research their shared genealogy. “Everyone in Iceland is related,” she explained. Sure enough, and within seconds, they’d found only five degrees of separation. I was told that this process is common in the country and that almost everyone carries around their lineage in a phone app. Hugs were exchanged between newfound family as the chef set down a small paper up in front of me. In it were four tannish-gray squared chunks, measuring about a half-inch per side, each skewered with a toothpick. The women looked at me and smiled a challenge. I then knew what awaited: hakarl or “rotten shark.” (Iceland tourism references it as “putrefied shark,” to vainly make it sound more palatable, and the restaurant menu listed it as “fermented.”) I was given one recommendation/warning, “Don’t smell it.” My wife, normally fearless in the world of exotic cuisine, didn’t heed the advice, sniffed, immediately regretted having done so and refused to venture any further. Her near panic look to me was one you’d get from a mate prior to taking on Niagara Falls in a barrel. I, unsniffingly, went for it. They waited. There was no big… anything. It tasted kind of similar to some weird, semi-soft and overripe cheese. When I reached for a second piece, shock set in ––for my audience. I remarked, “It’s not that bad,”and my wife suppressed a gag reflex. My hostesses then pushed forward a small glass of brennivin, a highly alcoholic caraway seed-laced grain beverage. “With hakarl, we always drink it,” said my guide. “A lot.” I drained the glass –just to be social, you understand. My wife drank some as well, if only to revive herself from a post hakarl-sniffing swoon. Café Loki is open for breakfast, lunch and dinner from 9 to 9 with lunch specials served between noon and two. Chef Hrönn features meat and fish dishes, but there is a vegetarian plate offering as well as a wide choice of luscious, baked goods, some of which are larded with skyr, a healthy, low fat and mild yogurt that is so Icelandic it’s even mentioned in some of the revered Viking sagas. How Loki can you get!? 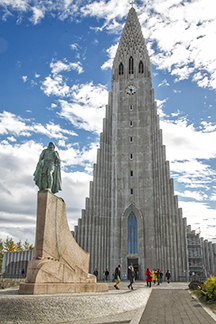 Directly across the street from the Café Loki, a statue of Leif Erikson stands before Reykjavik’s landmark Hallgrímskrkja church. 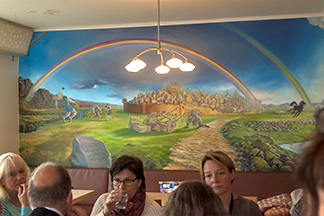 Café Loki’s full wall mural of the aesir (ancient Norse gods). Just one of the café’s tasty “Icelandic Plate” samplers. Café Loki’s owner/chef Hrönn and guide par excellence Heidi find their common roots. 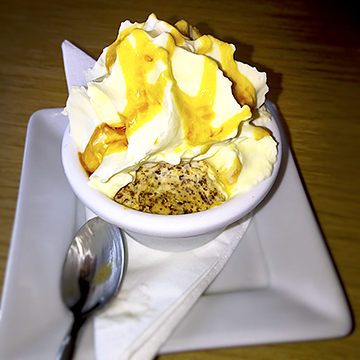 Rye Bread Ice Cream; sounds weird, tastes great! 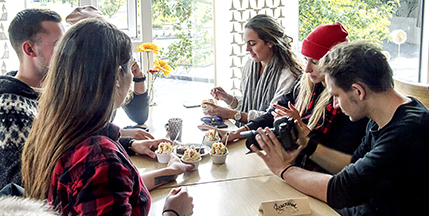 A Reykjavik foodie tour concludes with Café Loki’s unique Rye Bread Ice Cream.